I just did a google seach and came across this. 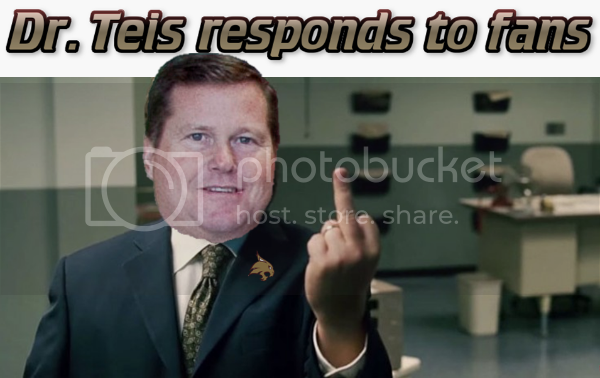 Meanwhile, over a decade later and Teis still has his job. Complete aside, but has the Loud Crowd been to any football games this year? I know they usually have a presence at basketball games, but can't recall seeing them out in the student section all that much. Alright guys, we've had a lot of ideas thrown around, but we need to start working on our next step, whether that's raising funds or bringing banners to games or whatever. Josh, with yourself being a large catalyst for all of this, I'm on board with just about anything you can think of. I, personally, like the idea of taking out an ad in the Daily Record. We're growing in numbers and support, but we need to act before the athletic department thinks they've gotten rid of us. I, personally, like the idea of taking out an ad in the Daily Record. Keeping the website up to date and full of information is key. I'd suggest adding a link to accept donations to keep the website going. Additionally, I'd look into some SEO activites like buying key ad words through google so that the website comes up anytime some searches using key terms. Additionally, make sure partner sites like forgotten5, swc, etc. are linking back to the site so it improves natural search as well. I like that idea. I know a local company here in San Marcos that does SEO. If whoever runs the website wants that contact, let me know. Didn't want to start a new thread, so figured I'd just post here. Attendance trends now in our 7th season in FBS. Those attendance numbers are pretty bad. If we have another year or 2 of less than 15K do we get kicked out of FBS? Not a chance. Some teams haven't averaged 15K in 10 years and they're still in FBS. Unlikely. That's one of those requirements that serve as a lever for the NCAA to pull if ever needed. It serves a greater role in determining when/how a school moves up into FBS. If someone creates a 1/4 page to full page ad for the Daily Record i'll definitely donate to that. Correct me if I'm wrong here, but what is the benefit of posting it in the SMDR? Most of the big money donors aren't living in San Marcos. In fact, I'd say the majority of our donors don't live in San Marcos. Hell, I'm not even sure that a newspaper article would do much good overall. Not trying to shut down ideas, just giving my thoughts on it. True, it was started earlier in the thread. I guess I should have stated Newspaper ad. I'd be ok with San Antonio Express and/or AAS too. newspapers are laying off giant chunks of their staff because readership is down so much. the statesman just got sold to a new ownership group and the 1st thing they did was offer every employee a buyout. print news is a dying medium. your money would go so much farther w/ targeted online advertising via googleads, facebook and twitter.